Our ancient ancestors grew up in a world of stress and scarcity. Food was often not available and intermittent fasting was common. This form of life left a genetic blueprint with key information pertaining to our health and wellbeing. Intermittent fasting reduces free radical damage, regulates inflammatory conditions in the body and starves off cancer cell formation. In nature, when animals get sick they stop eating and instead focus on resting. This is a primal instinct to reduce stress on their internal system so there body can fight off infection. 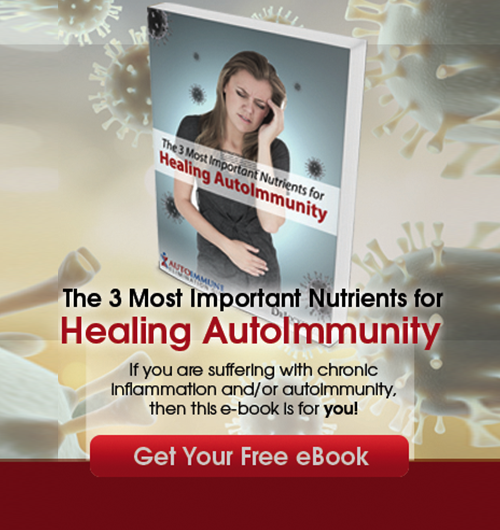 This natural mechanism allows the animal to concentrate all their internal energy systems towards immunity. Humans are the only species that often look for more food during times of illness. 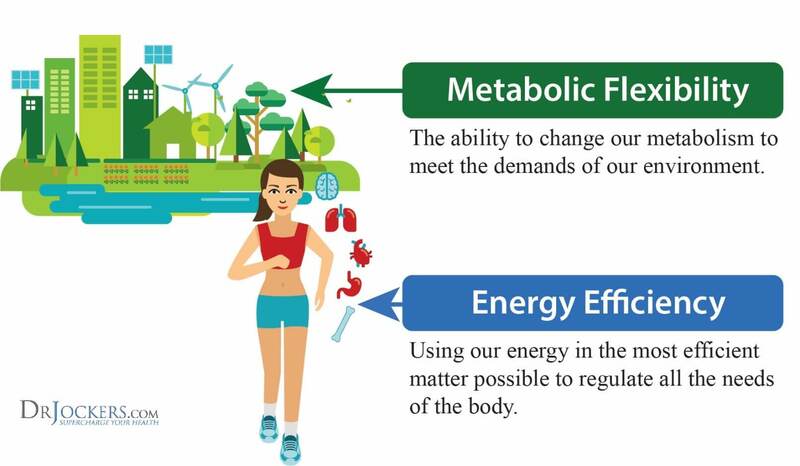 The body has a certain amount of available energy that it diverts into important function such as digestion, physical movement (kinetics), immunity, cognition, etc. The continual need to digest food diverts energy away from these other factors while fasting conserves energy for use with these other systems. In fact, the digestive process diverts huge amounts of blood and is considered energy expensive. When we eat food the immune system gets activated to increase inflammatory conditions to ward off any unwanted microorganisms within the food. This happens whether the food is raw or cooked as nothing is truly sterile. When the immune system activates in order to attack newly ingested pathogens it is using up its energy reserves that could be used for other activities. Fasting frees these white blood cells up to destroy dormant infections and other problematic areas. The practice of fasting allows the body to put more energy and focus into the process of effective immune regulation. Fasting while drinking water and cleansing beverages flushes out the digestive system and reduces the number of natural microorganisms in the gut. The microorganism count is typically regulated by the immune system. So this allows the immune system to divert energy to other more important areas. 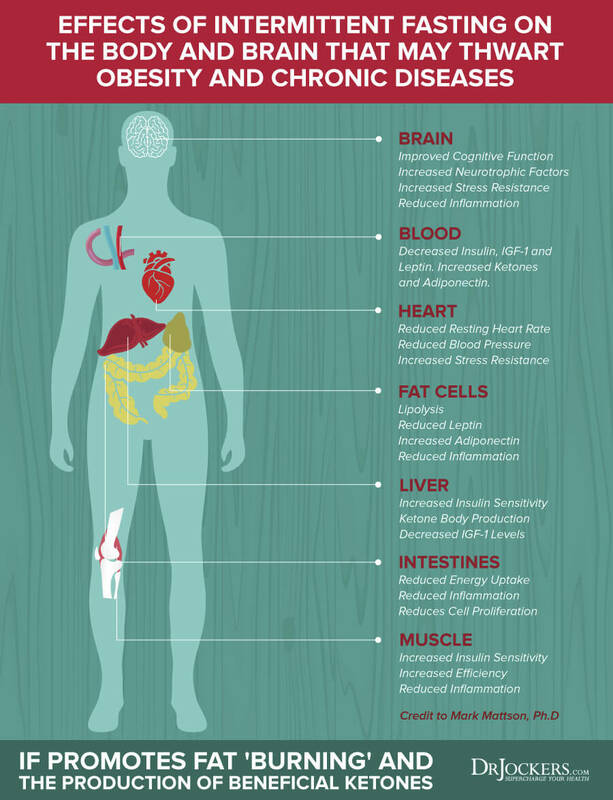 Intermittent fasting is a terrific regulator of the immune system as it controls the amount of inflammatory cytokines that are released in the body. Two major cytokines Interleukin-6 and Tumor Necrosis Factor Alpha promote an inflammatory response in the body. Studies have shown that fasting reduces the release of these inflammatory mediators (1, 2, 3). The immune system modulation that intermittent fasting provides may also be helpful if you have moderate to severe allergies (4). 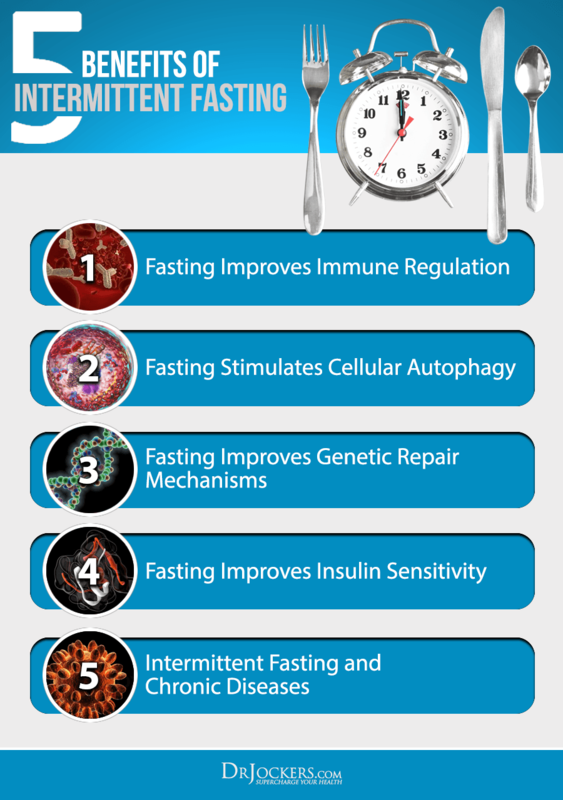 Fasting also stimulates the process of autophagy, where the body breaks down old, damaged cells and abnormally developing cells to recycle for energy. The process of autophagy is part of the innate immune system and utilizes pattern recognition receptors to identify viral cell invaders. Intermittent fasting stimulates autophagy processes which restrict viral infections and the replication of intracellular parasites. This catabolic process helps the body rid itself of intracellar pathogens as well as abnormal cancer cell development. It is also important in protecting the brain and tissue cells from abnormal growths, toxicity and chronic inflammation (5). 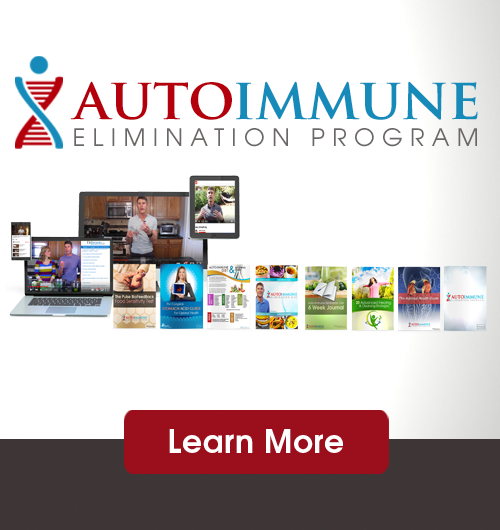 Individuals with auto-immune diseases such as systemic lupus, rheumatoid arthritis, colitis and Crohn’s disease have seen a tremendous improvement in symptoms with the incorporation of intermittent fasting (6). This process reduces the hyper inflammatory processes these individuals undergo and allow for more normalized immune function. Cancer cells are known to have anywhere from ten to seventy times more insulin receptors than normal cells and depend upon anaerobic metabolism of sugar for fuel. Intermittent fasting starves cancer cells and leaves them vulnerable to free radical damage and ultimate destruction (7, 8). Yes, awesome strategies that get results!!! I eat from noon to 6pm only. I start with apples, bananas, and blueberries. Is it bad to break my daily fast with that much fruit? I feel really good! Hey Mark! That is a lot of fruit. I would maybe only recommend a small handful of berries or half a granny smith apple along with some healthy fats. Breaking your fast with that much fruit is probably causing a pretty strong blood sugar spike. If you feel good, that says a lot. I too tend to eat a lot of fruit and I open with fruit. I’m reluctant to stop it bc a few people say I should. My blood lipids are perfect. Best to find what works for you! Hi! is there a set food list you to use for the intermittent fasting? I am currently doing the 16:8 daily and Love it! but not sure if I am supposed just eat 2 meals with no snacking or if you can meals and snacks throughout the 8 hours as long as you are sticking to your calories and hight fat/mod protein and low carb. Can you have bananas? Thank you! Bananas are pretty high in fructose so I would not recommend them on a regular basis! I am doing chemotherapy for breast cancer when should I fast b4 treatment right after or does it matter? How long should I fast? If you are going to do chemotherapy, you could fast before in addition to daily intermittent fasting and a ketogenic diet. Make sure to consume plenty of antioxidant-rich foods to help control inflammation as well. Hi there, just wondering how I would do intermitten fasting being a Type 1 Diabetic? Thank you. Hey Diane, you would simply fast like anyone else and adjust your insulin dosing as necessary. As you normally would, keep an eye on your blood sugar and adjust accordingly! Yes where did You go to medical school? Hey Raina, there are many approaches you could take. Some people do really well will strict water fasting so if you decide that that is for you, then that could be really helpful. For people dealing with issues rooted in chronic inflammation and autoimmunity, Starting with a water or bone broth fast of 3-5 days, followed by a week of liquid nutrition in the form of smoothies (high-fat, low-carb), and following that with some variation of ketogenic diet. If you would like to work with someone to help you put together a plan like this, then I highly recommend you send an email to michael@drjockers.com to get started, as well as with any questions you may have! I have recently been diagnosed with Ramsay Hunt Syndrome. I have now more or less fully recovered (95% back to normal). RHS is a reactivation of the chicken pox virus (shingles) of the ganglion encompassing the facial, hearing and vestibular nerves. I didn’t have it too bad compared to some so I’m assuming my immune system fought it reasonably well. Because this is very rare (1 in 100,000) I’m concerned, number 1, why it happened, and, number 2, in case it happens again. My immune system must have been compromised when it happened so I want to know how to boost my immune system to reduce the chance of it happening again. Sorry to hear this! We have no experience with this condition but I would imagine fasting would be very helpful since it is viral based.